When I started this blog back in September I had two goals in mind: provide people with hard-hitting fake news and promote awareness of Brett Favre's poor performance and over-rated career. With these goals in mind I would just like to thank Brett Favre for keeping Or Give Me Death alive by staying in the league another season. 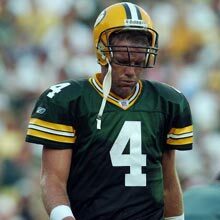 Honestly, what would I do if I didn't have Favre's interceptions to keep track of? There's nothing that can replace the Favre INT Watch. Fearing an early retirement, I tried to work in the DOOMSDAY COUNTDOWN, but it's just not the same. But thankfully, Brett's back and the counter is here to stay. I don't want to bring that baby down until he breaks the record - which he will. Back in August, I predicted it would take 3 seasons for the Gunslinger to shatter the interception record but he shut me up by throwing a career-high, league leading 28 interceptions last year. Now he could easily break the record this year! Good hustle, Ironman, way to go the extra mile and prove me wrong. Finally, I've got a message for new Packers coach Mike McCarthy - I know all the Pack read the blog - Mike, Aaron Rodgers is a bust and if you bench Favre you're betraying Green Bay and a coward. 28 April, 2006 (El Paso, TX): El Paso County Sheriff officials are searching the mountainous regions of north El Paso for what they believe might be a violent animal after the discovery of the second mountain-biker found dead in as many weeks. The unnamed biker was found dead, apparently beaten to death with his own arms, which were discovered approx. 300 yards from the body. Since January, four deaths and two injuries have already been attributed to the mystery assailant. In a statement to The El Paso Times, El Paso City-County Animal Regulation & Disease Control has denied reports of a wild primate on the loose in West and Northeast El Paso. Sheriff officials are looking for what could be either a wild primate of some kind or a deranged, incredibly strong person in a gorilla costume. During a press conference early Thursday morning, regional Game Warden Bill Meyers said, "No man could inflict the damage we've seen, we've got an animal on our hands...I've seen this before." A spokesman from the Sheriff's Dept. 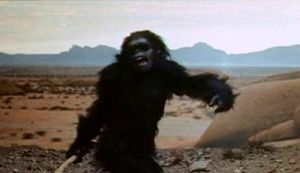 was less convinced of the existence of a gorilla on the loose saying, "I think it would be best to wait until all the facts are in before making any grandiose assumptions about the existence of an El Paso 'bigfoot.'" Or Give Me Death will continue to follow this story as it develops. 17 April, 2006 (Marin County, California): Convicted murderer and former hippy cult leader Charles Manson will reportedly be released following his 2007 parole hearing. Sources inside the California Board of Prison Terms say that drastic improvements in Mr. Manson's behavior have led the Board to believe that the troubled folk singer is fit for release under strict observation. The Board is said to have been moved by a recent letter sent to them by Brian Wilson of the Beach Boys. Manson, who wrote the Beach Boys song Never Learn Not To Love, recently contacted Wilson after years of silence. Initially hesitant, Wilson became convinced after two years of correspondence that Manson had been rehabilitated. After a recent visit to San Quentin Prison, Wilson made it his mission to have Manson freed. 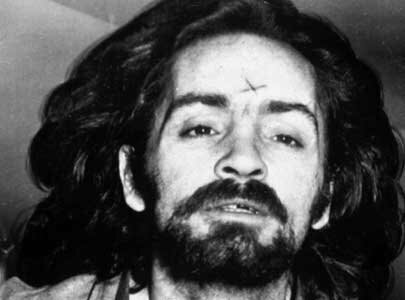 Charles Manson claims music is his "soul" and has been the key to his rehabilitation. In a recent hearing Manson said that if released he would "get back to his roots" as a folk singer and begin work on a studio album for Capitol Records. This will be his first release since the 1970 breakthrough album LIE: The Love And Terror Cult. Wilson is expected to produce a digitally remastered re-release of LIE as well as Manson's latest effort. Rumors of a Manson/Beach Boys tour have yet to be confirmed. Due to parole restrictions, however, any tour would have to be limited to California. The Coachella music festival has expressed interest. 9 April, 2006 (Les Cayes, Haiti): A man who gained notoriety as the "Zombie Man of Les Cayes" can now call the mayor's mansion home. Voters in a recent runoff election chose the alleged "zombie" to be the next mayor of Les Cayes. "Zombie Man" and mayor-elect Clairvius Piaf has repeatedly made the claim that he was zombified at the age of 19 and forced to work on a sugar plantation for three years. 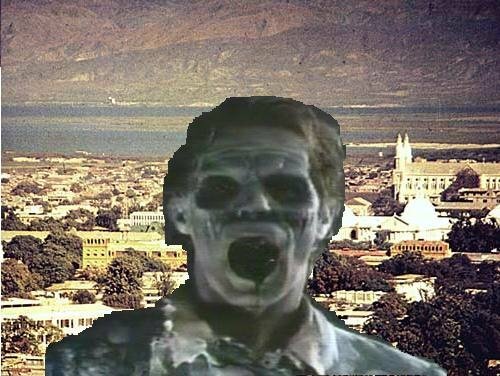 Zombification has reportedly been practiced in Haiti for centuries. According to folklore and research conducted by anthropologists a mixture of toad skin and puffer fish poison is used to simulate death. After "dying" the victim is revived and then given a hallucinogene to create a mindless state. Piaf was declared dead on May 1, 1985 and then reportedly resurrected within a month. Afterwards, he was forced into working on a sugar plantation without pay. After he had worked on the plantation in a supposed zombie-like state for three years his captors abandoned the plantation and its zombie day-laborers for unknown reasons. Upon achieving his freedom Piaf is said to have wondered thru southern Haiti for close to a year before snapping out of his zombie trance. Piaf became a local legend as he traveled throughout Haiti telling of his ordeal. His autobiography, La Vie De Zombie, remains a best-seller in Haiti today. Over the past decade Piaf turned his popularity into political support and now looks to be a major player in Haitian politics. Piaf does have a few detractors, however. Some of the mayor's political rivals have challenged Mr. Piaf's zombie claims. Then there are other rivals who are less skeptical of Piaf's zombie past who claim that Piaf is in fact still a zombie and under the control of corrupt party officials.